Some fans were surprised to see the Giants break camp with three catchers. Manager Bruce Bochy liked the flexibility having three catchers gives him with late-inning substitutions. He also liked having a switch-hitting bat on the bench in Hector Sanchez. 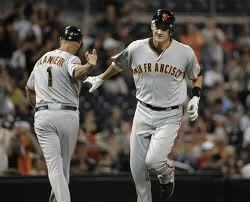 But as Sanchez has struggled at the plate, the Giants may consider sending him back to the minors to get more at-bats. His spring at-bats were limited by a sore shoulder. Guillermo Quiroz getting a start on Wednesday may be an indicator that the Giants could be leaning in this direction. If the Giants decide to send Sanchez down, who is the prime candidate to replace him? Well, Brett Pill is stepping up. Pill was a candidate to make the club in spring training before a knee injury derailed those plans. Pill is back playing and he’s heating up. Pill is hitting .354 with 5 home runs and 21 RBI in 17 games this season for Triple-A Fresno. He is on a 7-game hitting streak in which he is hitting .448 (13 for 29). He has belted home runs in each of past two games. Also interesting is that he has only 11 strikeouts in 65 at-bats. Pill has been playing first base for Fresno. If you start noticing him playing left field (or even third base), then that would be a sign that the Giants might be preparing to call him up. RHP Yusmeiro Petit has looked sharp in his last two starts. He struck out 13 — one short of Tim Lincecum’s Fresno record — in just six innings of work against Tacoma on April 19. He held Reno to three runs in six innings on Thursday in a win. 2B Carter Jurica is hitting .450 (9 for 20) in his last five games, raising his average to .371 on the season, 11th in the PCL. He also has a .436 OBP. 3B Adam Duvall: Duvall was off to a hot start, earning player of the week honors in the Eastern League. But he was placed on the disabled list with a disabled list and not expected back until early May. SS Joe Panik: Panik is heating up. He’s on a six-game hitting streak during which he’s hit 10 for 20, raising his average to .288. He’s also homered in two of the past three games. He’s also drawn four walks in the past three games, raising his OBP to .374. OF Javier Herrera. Herrera has a 8-game hitting streak, during which he’s 10 for 22 and raising his average to .324. He’s also sixth in the Eastern League with a .432 OBP. RHP Justin Fitzgerald. The 27-year-old pitcher continues to have a stellar 2013 and may soon earn a promotion. He threw five shutout innings with 10 strikeouts and one walk against Altoona. His season ERA is 1.42 with 29 Ks to BBs in 19 innings. RHP Kyle Crick: One of the Giants’ top pitching prospects went on the DL with an oblique strain. RHP Clayton Blackburn: Another top pitching prospect continues to pitch well. Blackburn has a 1.64 ERA with 25 Ks and 2 BB in 22 innings. 1B Angel Villalona: The one-time top prospect continues to progress. He is hitting 7 for 21 over his last five games with 1 HR and 7 RBI. He’s still hitting .193 for the season. RHP Chris Stratton: The 2012 first-rounder suffered his first loss on Thursday, giving up four runs in six innings. But he also struck out 11. He has a 2.38 ERA and 28 Ks and 8 BB in 22.2 innings. RHP Martin Agosta: Another pitching prospect is 3-1 with 1.71 ERA with 27 Ks and 7 BB in 21 innings. RHP Joan Gregoria: He is 2-0 with a 1.42 ERA with an eye-popping 25 Ks and 1 BB in 19 innings. He only pitched two innings in the nightcap of the doubleheader Thursday. No explanation there that I could find.